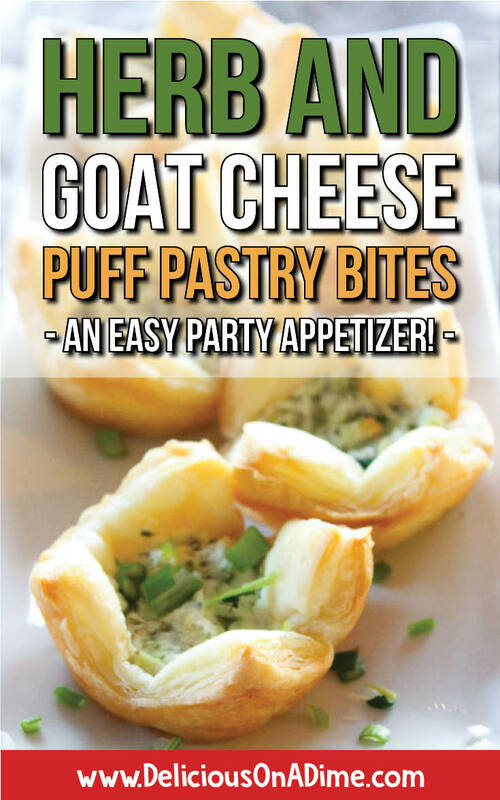 Home » Recipes » Parties & Potlucks » Herb and Goat Cheese Puff Pastry Bites – An Easy Party Appetizer! 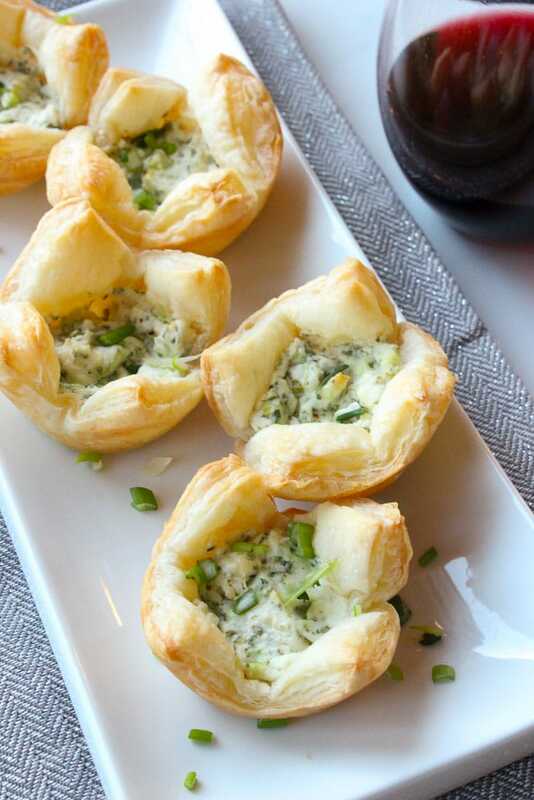 These Herb and Goat Cheese Puff Pastry Bites make the perfect easy party appetizer! 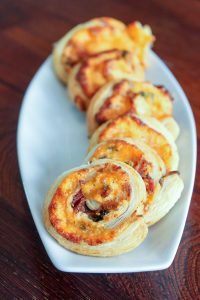 Whether you want elegant finger foods for New Year’s Eve or the holidays, or something light for casual entertaining, these puff pastry bites are easy and so delicious! Hello everyone! Hope you had a wonderful holiday and you’re getting ready for an exciting New Year’s Eve to ring in 2018! 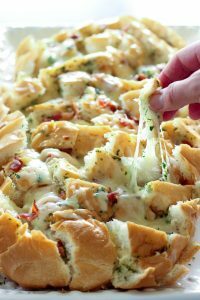 This is such a busy time of year for entertaining and parties – it definitely helps to have a few easy recipes for appetizers or finger foods that are versatile and delicious! The beauty of these herb and goat cheese puff pastry bites is that they’re light and fresh – and perfect for any time of year – winter, spring, summer or fall. So don’t feel that you can only make these during the holidays, just because they look a bit fancy. 🙂 In fact, pour yourself a glass of wine and make these for dinner – you won’t be disappointed! This recipe also calls for both cream cheese and goat cheese. Sometimes these ingredients can be pricey, but I LOVE them both and would never want to give them up, so in that case I try to find cheaper ways to buy them. Goat cheese is much cheaper when bought in bulk at Costco and can be frozen. Cream cheese often goes on sale and I wait for an amazing sale and stock up – the best before date on the packages is usually months away. 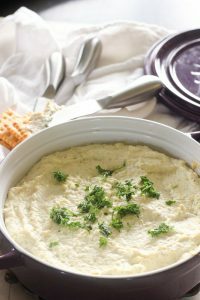 Other than those ingredients this recipe just calls for garlic and herbs (you can use fresh or dried – but fresh is always better, in my opinion) – and you can adjust the herbs to suit what you love or what you have on hand. You can also really easily double this recipe to make two dozen bites. Step-by-step photo instructions are below the recipe! 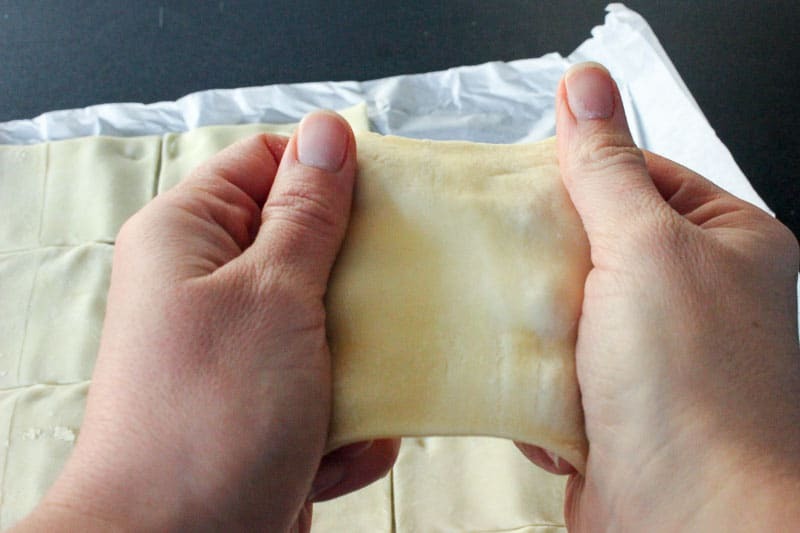 Preheat oven to 350 degrees F. Cut a sheet of thawed puff pastry into 12 squares (they will actually be rectangles), using a sharp knife. Gently stretch each piece into a square. Spray a muffin tin with non-stick spray (or grease it however you’d like) and gently nestle a square of puff pastry into each well. Set aside. 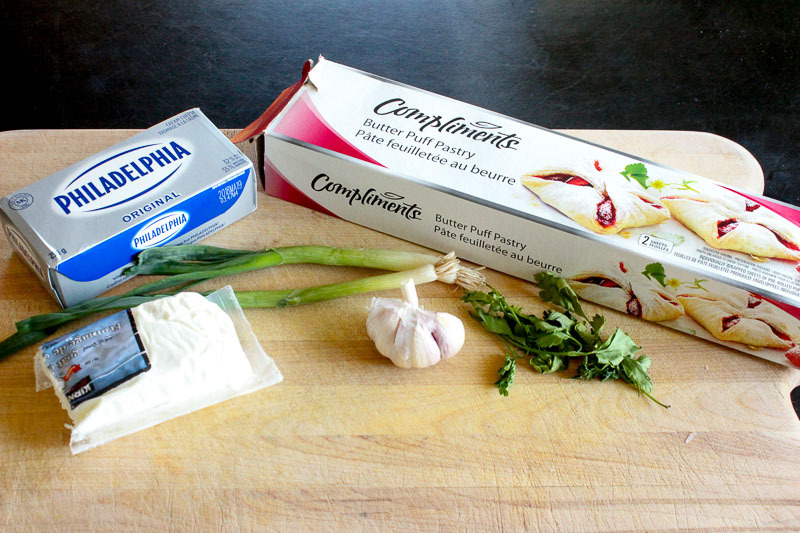 In a medium sized bowl, use a hand mixer to whip 4 oz of softened cream cheese and 2 oz of goat cheese until creamy. 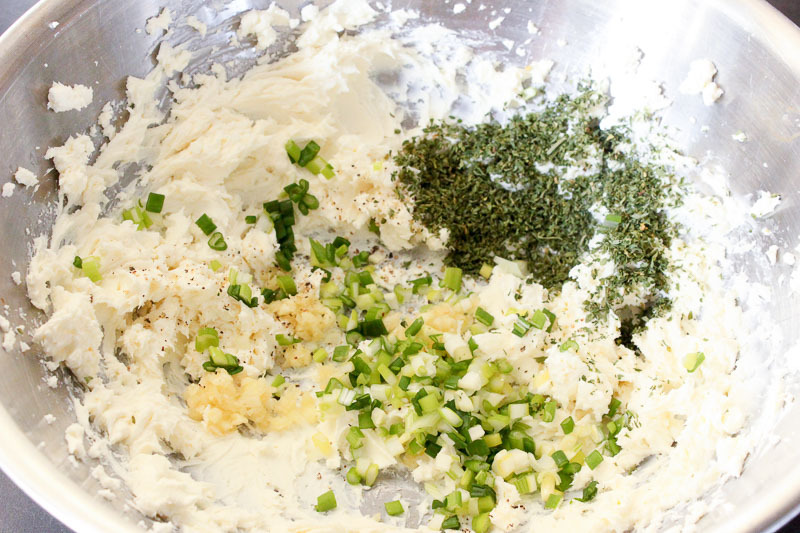 Add 2 minced garlic cloves, 2 chopped green onions (about 2 tablespoons) – or the equivalent amount of chives, 1 tablespoon of dried parsley (or 2 tablespoons of fresh chopped parsley) and 1/8 teaspoon of freshly ground pepper. You can substitute other herbs for the parsley if you want too – dill, basil and tarragon would all be delicious – either alone or combined. Mix well to combine completely. Scrape the filling into a smaller bowl to make it easier to work with. 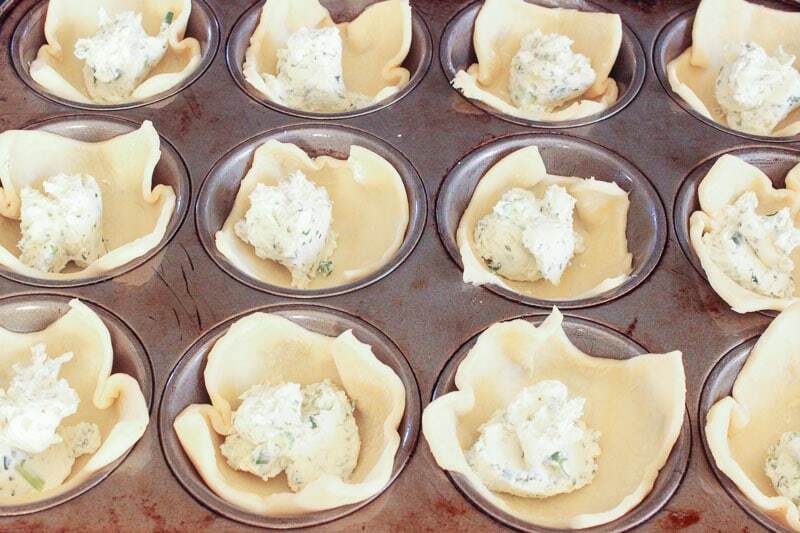 Divide filling evenly between puff pastry cups. I fit about 2 teaspoons in each cup. Bake for 17 minutes, or until filling is golden brown and puffed. Serve warm or at room temperature. Garnish with fresh chives or herbs if you want. 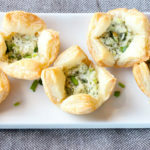 Herb and Goat Cheese Puff Pastry Bites - An Easy Party Appetizer! 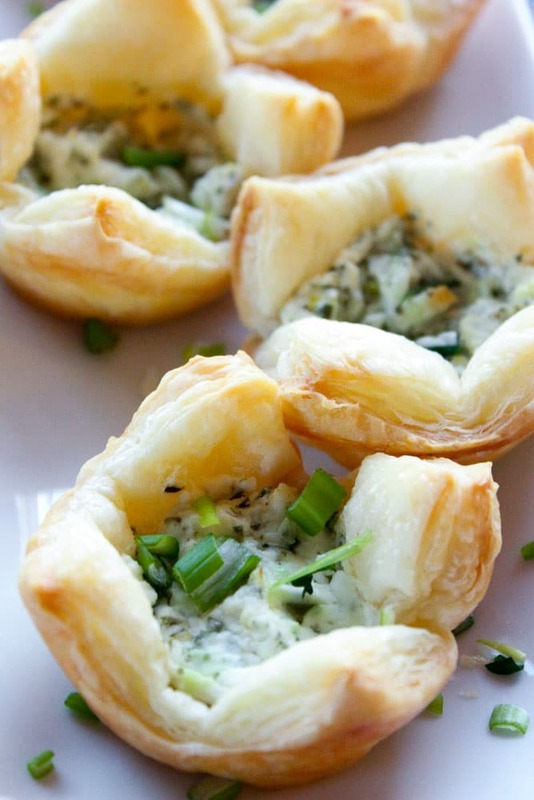 These Herb and Goat Cheese Puff Pastry Bites make the perfect easy party appetizer! Whether you want elegant finger foods for New Year's Eve or the holidays, or something light for casual entertaining, these puff pastry bites are easy and so delicious! 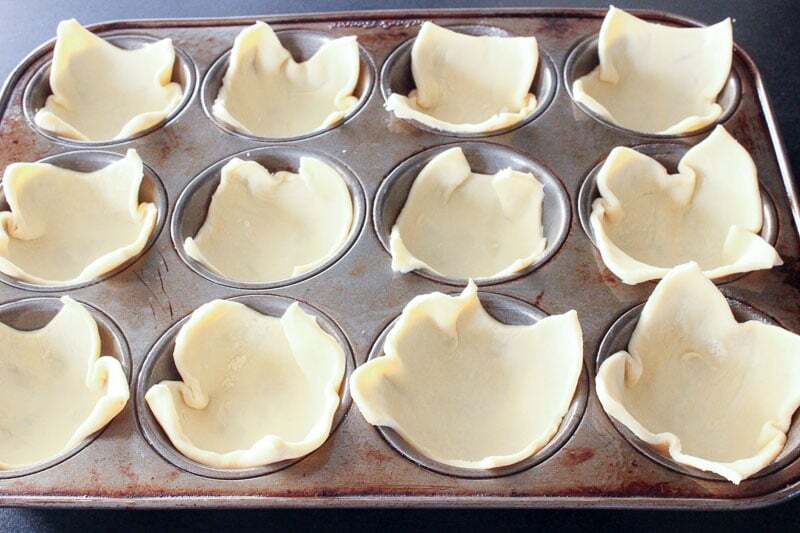 Preheat oven to 350 degrees F. Spray a muffin tin with non-stick spray. 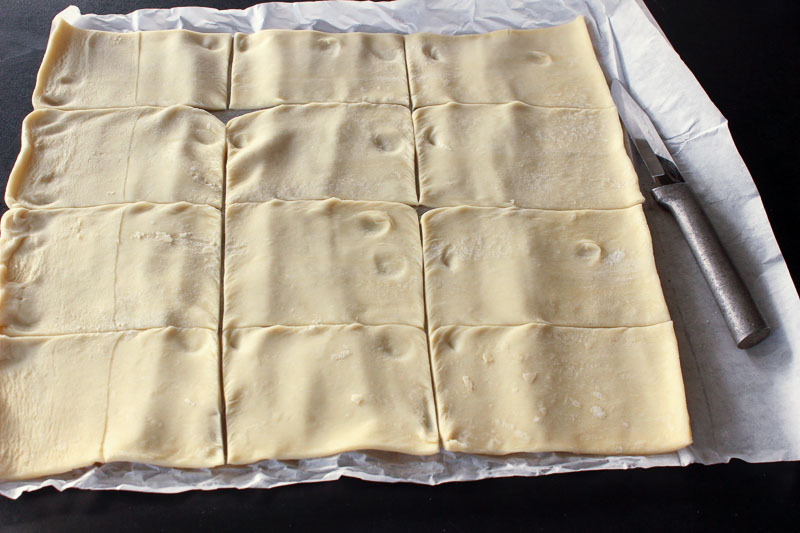 Roll out puff pastry sheet and use a sharp knife to cut it into 12 rectangles (see photo below) - 3x4. Lift each rectangle and gently stretch it into more of a square. Nestle it into the well of a muffin cup. Once they are all filled, set aside. 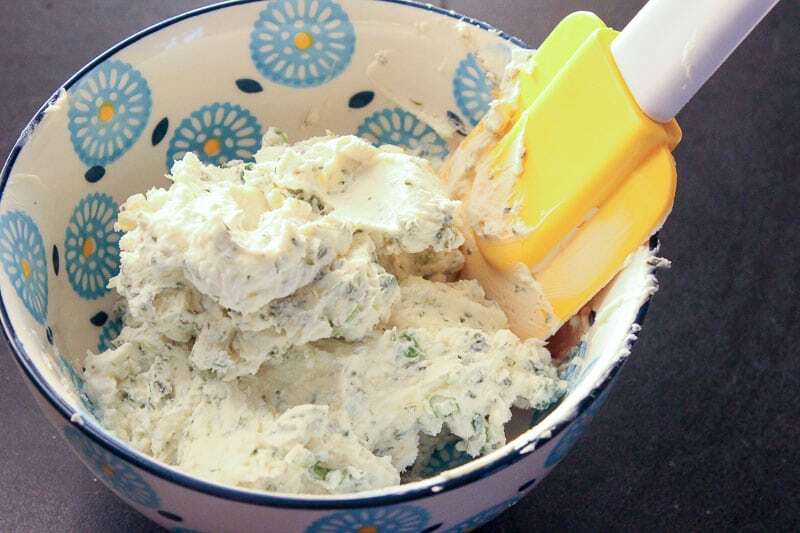 In a medium sized bowl, use a hand mixer to whip cream cheese and goat cheese until creamy. Add garlic and herbs and mix well. Divide cream cheese mixture evenly between puff pastry bites. * You can use any combination of herbs you like. Dill, basil and tarragon would also be delicious!